Yesterday, May 24th 2017, police in the Bay Area raided two houses and arrested one person in connection to the recent protests in Berkeley California. In this moment of increasing state repression, we must be vigilant in protecting ourselves, each other, and our communities. Never speak to the police. Remember that any response can incriminate you and others. 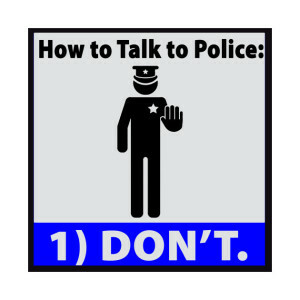 You have a right to remain silent, but not to lie – even to say “I don’t know.” Better responses are “I have nothing to say to you.” or “No comment.” We recommend practicing how to respond to emergency situations such as raids where police are particularly threatening and nefarious about getting you to speak to them. Share this information with friends and housemates, particularly those who are intimately tied to political communities but are not that involved or invested in them. These are often the people the state targets to get information on wider activist communities. Political repression in any form has the common purpose of undermining our movements as a whole, even when it seems particular individuals are the targets. Therefore it is extremely important that we all get prepared for further repression. We do this by supporting each other in remaining calm and brushing up on some basic know-your-rights information as well as being mindful of how we communicate on the internet. This booklet is the best know-your-rights manual to dealing with law enforcement encounters that we’ve come across. Although it was written for how to handle encounters with federal agents, the information is just as useful in situations with local police. The first chapter, which is only 8 pages, covers law enforcement visits and searches. The booklet also covers state infiltration, surveillance, grand jury resistance, and special considerations for non citizens. Now that there’s a far right, internet-based movement growing in this country, we have to deal with attacks on two fronts: the state, and the far right. The alt-right might put you on the radar to the state and/ vis versa. If our personal information is available online, the alt right can find you and “doxx” you, meaning they publicize your name, address, phone number and your family members’ names, addresses and phone numbers for the purpose of harassing and intimidating you. Below is an article with tips on preventing this from happening, along with a list of websites that the alt-right uses to uncover people’s sensitive, personal information. The state can and does monitor activists’ communication and internet activity. This website is an excellent resource for giving you step-by-step guides to encrypting and securing your various devices and computer operating systems. It also goes over encrypting email. With resistance comes repression and unfortunately often repression leads to more repression. We can help damage control this by always refusing to talk to law enforcement. Sometimes investigations result in grand juries. It is important to be prepared to remain silent if subpeoned to a grand jury. We should all prepare ourselves to support those who refuse to testify. This website has tons of information on grand juries, how they work, and the importance of resisting them. We particularly recommend reading the “Statement of Resistance” written by a collective of folks from various movements in the Bay Area and endorsed by dozens of groups, political prisoners, and former grand jury resisters. Lastly, if you or anyone you know has been approached by law enforcement or has been visited at their homes or jobs please contact the National Lawyers Guild at 415-285-1011 to access legal advice, resources, and support. Solidarity is our best weapon in the face of repression. Lets use it!